Please click here to return to the finance paper itself. (following discussions...) I don't think that a big new financial bubble is going to be a problem before 2025. Everyone is dealing with the hangover from the debt spree that ended in 2008, and they will feel the headache for quite some time. We will get periodic flare-ups in inflation, but this will be a way of dealing with the last bubble (it will not be presented as general inflation either, but as a series of unlucky specific shortages of oil, corn, pigs, palladium, land, fine art, etc. What is a power law? Preliminary note from Ed: Since this was posted, several people have written in to ask what is a power law? Consider a class of event that happens in a range of sizes scattered across time - epidemics, industrial disputes, traffic accidents and so on. These incidents can be grouped by the frequency with which a particular type occurs: for example, how frequently a given word appears in a body of text. It turns out that these relationships are constant and portable. To continue with the example of word frequency, it turns out that the most commonly encountered word - "the", in English - occurs twice as frequently as the next most common, itself appearing twice as frequently as the next on the scale. That works for any and all substantial blocks of general text, in any but the most impoverished of languages. A law about frequencies simply pops out of the general use of language. This particular kind of frequency is called a Zipf distribution, as discussed in the text. This kind of regularity can be generalised. Imagine a situation in which you have events of a certain size and a certain probability of being encountered: terrorist incidents, for example, as shown in the figure on the right. If you plot the number of terrorist incidents of a certain lethality against the frequency with which such incidents occur in time, you get a scatter that forms a nearly straight line when plotted on a log scale. This can be represented by an equation of the form y = axz, where the letter "z" is called the exponent. It represents the slope of the line. Of course, this is another way of talking about probabilities. How probable is it that a meteor of a given size will hit the moon over such-and-so range of time, for example? The equation that is given above can be used to derive this probability. How likely is a financial crash at some arbitrary period in time? The distribution of the likelihood of this can be estimated from the power law. The exponent - "z" - defines what kind of distribution you get. 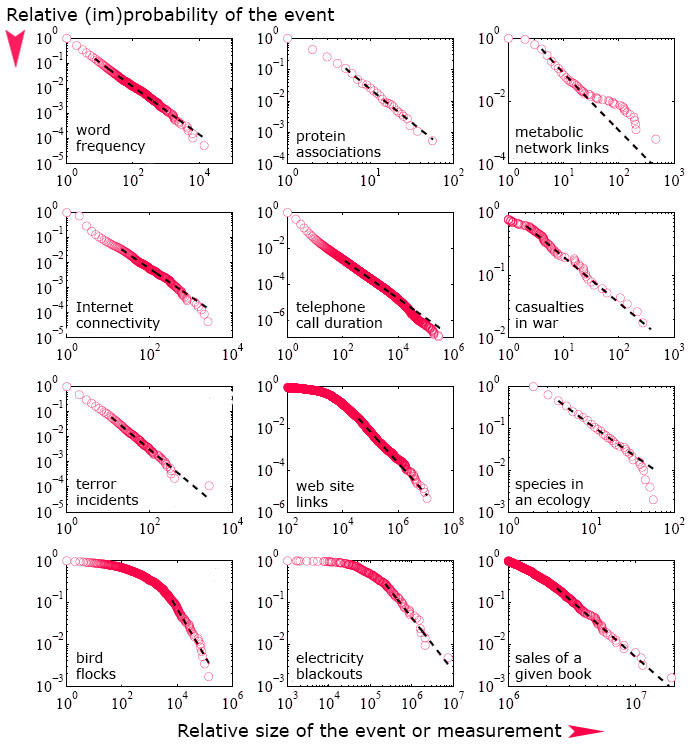 Zipf distributions come from exponents that are less than one, for example. They have quite different properties from distributions that are close to one, or from those much larger than it. On the instability paper (Comment 10) I was most struck by the notion that more of the same - stability - creates instability. That must be true of criticality follows a power law. It is now pretty well understood how the onset of turbulence in ship's wakes, chemical plants and oil pipeline is triggered in the same manner. Equally, failure in communications networks and traffic congestion also follow similar dynamics. The question, though, is whether sand piles, fluid flows or other structures are an accurate analogue for the economic and social world. It turns out that the literature on the topic is already immense. I recommend a fine review of this by Thomas Lux, written in 2006, but still a powerful summary. It is not heavily mathematical, and is written with a pleasant irony in respect of some ideas. Power laws and statistical distributions are mathematical twins, and a great deal of theoretical finance (and practical insurance) concerns itself with risk, as expressed by such distributions. All the popular literature about swans and their blackness relates to this. For example, power laws that scale at more than two give you a Gaussian distribution (scattered around some non-zero number), and power laws below two, a normal one (scattered around zero). At two, they vibrate between the two states, worrying markets: where is the ground state? Also, this affects what a data run tells you if you use a long series or a short one. Market volatility, high frequency trading and transaction size all follow power law exponents, giving rise to qualitatively different kinds of frequency distribution. Market price changes follow a Zipf law, which is best understood as one of its real world examples. Seagulls fly long distances, looking for fish; and then make a large number of short trips, feeding on them. This is a Zipf distribution in action - agitated small movements, then great leaps. (It has exactly the same mathematical form as those mentioned above, but with an exponent under one.) Well, that is what happens to market prices, too: rattling around then then great leaps. This seems common sense, but it is perfectly extraordinary that every market everywhere always follows this power law exactly. These power laws do not so much explain as illustrate the observation that share markets and foreign exchange markets on occasions seem to develop a life of their own, and at times appear entirely disconnected from their underlying economic fundamentals. Are people suddenly mad? Or should we think of this as self-assembling criticality, like the sand pile? One striking observation is that while financial markets follow Zipf laws, the macro economy does not. It follows a standard exponential power law. Mathematically, the number of random events in a system switch it from one kind of distribution to another, as we have already seen. This is called annealing - you see it in grain silos, where the corn tends to bridge the pipe work and the whole thing stops at random; but can be kept going by adding random noise - as it were, banging on the pipe, but much more quietly and with a random time-signature. Once again, there is a power law that governs both clogging and the effect of the random noise in un clogging this - it follows the same form as the difference noted above. Financial markets are generally more responsive to short run, internal events than they are to external random noise, unless that noise is a bang on the pipe, a major event. They are therefore both prone to bridging phenomena - getting "stuck" - and lacking in the random noise that keeps things moving. 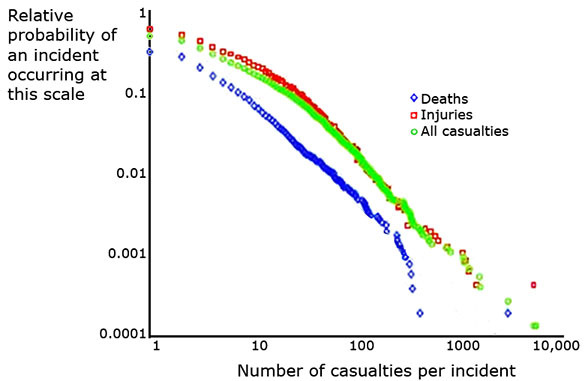 Hence the Zipf mini-avalanche, when the gulls go looking for new fish. There is a concern as to how these laws "connect" to behaviour which, surely, shapes market behaviour? A wave of models try to generate the power laws from the connectivity of the agents in the market place, rather than the other way around. For example, a model that allows each trader to behave in ways that is affected by the opinions of his or her immediate network is capable of generating both Zipf distributions, general power laws, bubbles and crashes. Periodic wobbles and crashes could be generated by the breakdown of majority views in these networks, translating as a change in market sentiment. These models have been extended to allow agents to switch strategies (from "market fundamentals" to momentum trading, for example) and to couple their sentiment to their actual returns. External information is added at random. Many hundreds of such simulations have been built, with startlingly constant outcomes. The predominant observation is that whilst market behaviour is never entirely decoupled from external conditions - the random inputs - the processing of this information amongst the agents always developed scaling laws as an emergent property of the system. One fascinating feature is that such structures give rise to periods when events lack all direction and the market "chatters" around an indeterminate mean, before suddenly darting off on a Zipf flight. Quote from Lux, above: "One might note that "self-organizing criticality" would not be an appropriate characterization as the model does not have any systematic tendency towards the critical state." One area that these thought shave opened up is the use of what are called Multifactorial / Multifractal models for predicting volatility. Quant traders use these widely, as understanding volatility in market sectors is closely related to other peoples' portfolio strategies, allowing predictive counter-trading. The mathematics are breathtakingly frightful and I will not attempt to expand on this. I want to end with a slightly different thought. A great deal of these concepts have been imported from physics, geology and biology. One factor that biology has offered is the notion of the "weak key". This derives from the Nobel-winning work of Jerne, concerned with antibodies. These, as you will know, cling to molecules that they are "designed" to immobilise. Hitherto, it had been though that biochemical processes were highly determined - one molecule fitted another exactly, and nothing more. It turned out that this was not so. A given antibody, enzyme or receptor could stick to a range of others, with varying degrees of effectiveness - that each lock might have on or several keys, and so these became known as "weak keys". This has had enormous resonance elsewhere. It implies both that systems elements can configure in much wider patterns than previously thought, and also that similar systems from very different origins can do the same job. Applied to political systems, for example, roughly similar elements will get on together - can undertake much the same functions - and so acquire extended networks. Dissimilar structures do not generate such networks. As the emergents that we have been discussing come down to connectivity and information flows, this defines how clusters of behaviour arise in otherwise similar structures. If Company A and Company B "get on", then they will build intensely strong links relative to the remainder of the marketplace. Their dynamic will become a voice in the system, influencing outcomes. This text is about Comment 9, the fitness for purpose of the financial system and regulation. Regulation is not about measurement, regulation is about judgement. Indeed, extremely complex, fact based regulation can get in the way of common sense, or indeed occlude it altogether. My sense is that the banking regulations that are under development will walk us into terrain where we feel well-protected, but where all sense has really been lost. The 1988 Basel I agreement was only 30 pages long. Local interpretation pruned this to even fewer pages - in the US, for example, it came out in only eighteen pages of regulatory requirements. It concerned itself with broad asset classes and a limited set of credit risks. It was possible to calculate capital ratios with a pencil. Basel II was ten times longer than Basel I, at 347 pages. Basel III has 616 pages. Local legislation expanded this to over a thousand pages in key markets and the data so generated are beyond human scope to comprehend. New regulation - the Dodd-Frank act, for example - is even larger and will generate even more minutiae. The wave of new credit and market risk models that emerged in the 1990s made Basel I look weak, and in 1996 the Market Risk Amendment was introduced. The notion of using the trading book as a regulatory tool was created. Banks were required to use (their own) abstract models in order to calculate the required regulatory capital required by their current market risk. Calculating and delivering this was a matter for the banks' internal mechanisms. The models were not standardised. Basel II emerged in 2004, developing and extending these concepts. Banks' own models defined their regulatory requirements. These models were usually constructed to deliver a minimal capital requirement. Basel II drove banks to improve their risk management technology, fragmenting broad asset classes and rendering the entire structure incomprehensible to any but the machine making the assessment. The financial crisis showed up the holes - managerial and actuarial - in this arrangement. Basel III was launched in 2010, however staying with self-assessment and extending the scope of the risk modelling. However, it made the requirement even more complex. The banking book required assessment of every single individual loan exposure. The weighting parameters - default probability and loss-given-default - still have to be estimated individually and a given bank may require several thousand of these to be kept up to date. The inputs to the trading book risk assessment are, of course, even more numerous: a value-at-risk model requires that there be a covariance matrix of all of the risk factors, therefore demanding millions of individual risk assessments. All of these are necessarily subjective, and all are probably done in ways that are not over-thoughtful. But even then, the process is not complete. A range of pricing models, each with its embedded assumptions, are used to go from these risk factors to the valuation of individual financial entities and instruments. Disaggregation on this scale removes the resulting computations from any possibility of human insight. Guesses that are processed as fine disaggregation remain guesses, but they appear somehow to gain substance and weight in near proportion to their opacity. The time run of the data that are used to calibrate these models are necessarily limited. After all, we started to collect and retain such data at most only a couple of decades ago for the big aggregates, and much less than half that for trading. The idiosyncrasies of the period are naturally embedded within the data runs. We are, therefore, trying to calibrate a system with a million or so free parameters from short time runs, when we know from the mathematics that extremely long time runs - hundreds of years - are needed to properly calibrate even very much simpler models. Domestic legislators have since made the matter even more opaque. The US Dodd-Frank Act of 2010, itself 848 pages, requires that a further four hundred pieces of regulatory legislation to be put into place. This process is far from complete, but in 2012 about a third of the required legislation had been completed, generating over 8800 pages of text. These regulations are, therefore, following the compliance data into a realm of complexity that no human - and probably no group of humans - can fully understand as a unity. Equivalent European legislation is incomplete, but informed estimates expect something around 30,000 pages of text to come from it. Does all of this complexity serve a purpose? Some might think that if some bean counting is good, then mass bean counting must be better. Yet this cannot be true. For all its complexity, Basel III allows banks to borrow 33 times their assets. Any bank, looking at a loan with similar gearing would immediately reject it. Banks would have needed a 7% - versus mandated 3% - gearing to have survived the financial crisis. We know that, but we have not implemented it, for reasons of habit and lobby preferring to continue with the high wire act. A philosopher king of a regulator would not, of course, rely wholly - or much at all - on this plethora of data. He or she would look to the fundamentals. There are two problems with this approach, one the difficulty of finding such a paragon, and the second that of placing so much at exposure to his or her judgement. Philosopher kings are rare in finance because major crises occur only once in most lifetimes, and people who pursue a normal career will live through at most one market cycle. Tobin's famous ratio - the swings between a preference for liquidity and hard assets - show the long, slow alterations in market sentiment that define how we think about finance in any one five year period. Someone formed during a down swing will not have the reflexes for its opposite. There can be few fields of human endeavour in which history counts for so little as in the world of finance, according to Galbraith. So: if we cannot rely on an ocean of data, and we cannot rely on common sense, then what is to be done? Perhaps the medical notion of triage may help. Admission to a hospital is usually arranged into a tree structure, such that a series of increasingly sophisticated questions are posed only once the more basic issues have been sorted out. As a result, patients are sorted into categories, for treatment by focused groups. Specialist teams are able to focus on the topic of their specialisation, and the cardiac team only occasionally have to deal with a patient with a fever. Much the same is - or perhaps should be - true of regulation. It is clearly the case that simple ratios give a relatively tight handle on which organisations have a problem, and what kind of problem they have. Relationship building gives similar insight. These are not relationships built with the subject of the regulation, but rather with the many agencies and client groups that it touches, with the industry as a whole and with the cluster of journalists and academics who study the industry. Everyone in the oil and telecommunications industry knew that there was something odd about Enron and Worldcom, long before they went bankrupt. The forensic aspects of regulation require much deeper insight. This kind of surgery should, however, follows on from a diagnosis that something is wrong, not the presumption that something might be. However, much as doctors are increasingly unwilling to use common sense approached to diagnosis for fear of accusations of malpractice, so public regulators are thought to need to display microscopic oversight on the thing regulated. What we need to demonstrate in clear terms is whether such oversight is better or worse at predicting and managing problems than are other approaches, and how the two can be made complementary. Elsewhere, there is a comment to the effect that we will manage the financial industry better when we are able to perceive - visualise - it better. That is certainly true. It is questionable, however, whether current initiatives will lead to threat overview, or merely to a view obscured by the dust of minutiae and guesswork that represents current reporting. Indeed, the very existence of such an overview would probably destroy the grounds on which speculative trading occurs. That is a good thing or a bad thing, depending on from whom you draw your salary. Deutsche Bank analysts have looked at long-run returns on assets. They found several series that go back several hundred years. The US has records that go back to 1790, and the Bank of England has a series back to its origins, in 1694. Holland kept records since the early 1500s. In each case, current returns on assets and real interest rates have never been so low. Central bank balance sheets are also extraordinarily expanded. There are two points I want to make about this. First, the past is no guide to what happens next. Second, whilst the machinery to allocate scarce resources - the heart of "capitalism" - will continue to operate, perhaps this is the end of capital as the scarce resource. For example: companies have masses of capital at their disposal, but they are not investing. Clearly, they are being held back by something else. So what might the scarce resource be, if not savings? The project looks like it will work if the environment stay in reasonable bounds. The environment looks as though it will indeed do that. Second, they assert that they know what they want within this balance of outcomes - to be able to say that "this is a good project, but it's not for us." All of that looks very like notions of strategy. But there is not objective measure that you can account to and say: that is our measure of strategic competence. So there are two layers on top of this: first, assuring your people that you have this, and that this is what it is. Second, gaining the trust of the world that you indeed have this competence. So, a slow down is not just about this or that firm not being confident. It is about everyone having confidence that all the other players are on top of their game. That is why when a simple-minded message gets accepted - "end of history", "wisdom of markets", "Internet economics", "Asian future" aka Japan, Tiger economies, China - the whole shebang starts bubbling, and forms a bubble. When there is no clear model in play, we get the opposite: mutual paralysis. 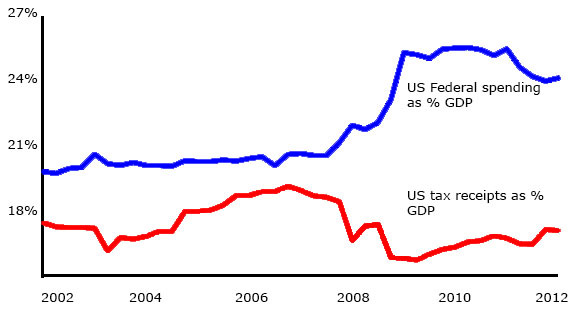 The following two charts show the consequences to US public debt of the financial crisis. Whatever the causes, the consequences will be with us for a long time. Stimulus programs which aim to get things moving today necessarily have the risk of prolonging the disequilibrium. State spending has risen - through various stimulus programs, as a result of increased welfare expenditure - while state income has fallen. There is some sign that these are coming back together again, but the US Federal government has been running deficits for all but four years since 1970. The impact on the public debt to GDP ratio can be seen from the figure. This is a tax on the future, essentially, as have been all of the previous deficits. However, repayments of principal plus interest become a significant component of state expenses in the years ahead. That said, political options vary from, in essence, ignoring the scale of the debt and let the future sort it out - or indeed, increasing the debt further, by "stimulus" - or by trying to reduce it. There are, of course, two ways to reduce the debt: either by increasing the size of the economy, and hence increasing state income from taxes, or else to cut state spending. The broad Left oppose spending cuts, and indeed want to "stimulate" the economy through further borrowing. In addition, it is asserted that the well-to-do are unwilling to spend, preferring to save, and so they should be taxed and the money given to the poor, who will tend to spend it on consumption, and also to the state to spend on grand projects, education and other favourites of the Left. The Right does not see matters in this light. It has four prescriptions on offer. First, the economy is not growing not because consumption is low but because companies are failing to invest. They are held back through macro-economic and political uncertainty. Second, it is the very instability of the deficits, most notably in Europe, that are responsible for this instability. The resulting prescription is to prioritise debt reduction and to enforce disciplines on the state which will reduce this uncertainty. The third view is that the state has gradually increased social support, to unsustainable levels, particularly in the light of impending demographic change and medical advances. Strong adult social support is said to reduce the propensity to work, and creates unrealistic expectations in respect of non-skilled wage levels. Prescriptions around this issue are ill-defined, but have two thrusts: assessment and the withdrawal of chronic support to all but those in critical need of it. Broadly, those who can sport themselves must be forced to do so, even at some hardship. Finally, the Right disagree completely with the notion that the state, directly or by proxy, can spend to stimulate more effectively that the original owners of the money. Tax cuts will, they assert, be more stimulatory than tax rises intended to subsidise the consumption by the poor. The Left is probably "wrong but romantic" whilst the Right is, well, "right but repulsive", as was said of the participants in the English civil war. (Stolen shamelessly from your introductory paper, btw.) The general liberal consensus is what has led to the continued purchase of social tranquillity and to the long run of deficit spending has probably hit the buffers. Billions of low wage workers around the world have seen to that. However, it is extremely unclear what Right policies will prove feasible, given the extreme social back lash that will meet attempts to dismantle welfare provision. The Right can hope to grow out of crisis, but those unable to compete in the world economy are not going to benefit much from this. Indeed, as they have not since the process of globalization began. We have all seen figures that measure the slow-to-no growth in real wages for low skilled individuals in the US since the 1970s. Here is a slightly different take on this. The figure is redrawn from David Lagakos & Guillermo L. Ordoñez (Journal of Monetary Economics Volume 58, Issues 6–8, September–November 2011, Pages 632–645). 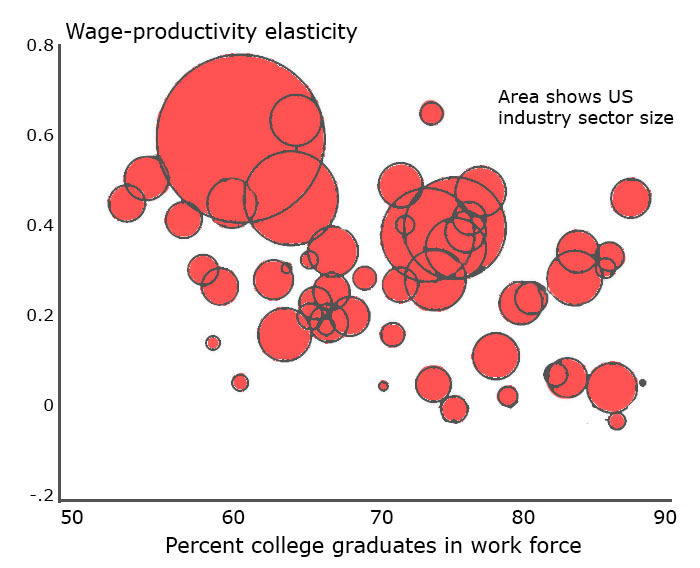 The vertical axis shows the impact of efficiency measures - such as new technologies - on the wages earned in specific US industries. Each reddish circle is a separate industry sector in the US. The horizontal axis shows the percentage of graduates working in the industry, with skill levels rising to the right. It is clear that low skill industries show sharp falls in wages as productivity increases. This is less true to not true of the high skill activities. This is a late comment, but I guess you'll have to forgive me. I was browsing your excellent 2040 work and I came across the discussion on clusters and innovation. I had also just had a look at the Davos world competitiveness report. The panel I give below shows three really important global relationships. You can see that In the centre, innovation is an important component of their competitiveness index, as validated by data. 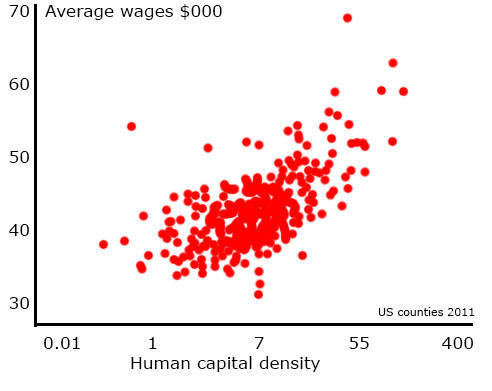 On the right you see that competitiveness is also related to the availability of scientists and technologists. On the left, you see how closely cluster formation and innovation are linked. One of our committees had been shown data from the US patent office. which strongly reinforces this notion of clusters, both as attractors of scientists and as the generators of innovation. The U.S. Patent and Trademark Office's geographic data on awards granted 2006-2010 is shown in graphic form in the figure below. I have pasted information about human quality by US metropolitan area below the patent data, and the relationship is obvious. Notice how numerically-tiny Silicon Valley eclipses the 20 million person entire New York region. Research shows that highly innovative people who work in a technical field need to work together, not merely in a project-dedicated team but in an environment of like-minded people, They "need" this not merely for economic reasons - see below - but they also have a psychic need to work with in an environment where their kind of guy sets the tone. (Very recent research shows that that around a half to two thirds of programmers score high on Autism Spectrum indexes. One commentator, who himself has high functioning autism, said that for him, it is heaven to work where 'pretty much everyone is on the spectrum'.) So I take issue with your "night clubs and facilities" analysis - pretty views and groovy night bring in the second wave of implementers and high salary earners, but not that actual innovators, IMHE. OK, so there is one final thing that relates to Comment 19. The figure above shows US counties by educational attainment and average income. The relationship is clear. There are dozens of similar studies which show the same thing happening: if you are well-trained, you earn more; if you work with other trained people you innovate more. Incentives are not usually so much about money. These people work for peer approval, craftsman's satisfaction and maybe some thoughts of money, but money earned through a buy out or similar coup, not money granted - from on high by the HR department, as a performance bonus=. These people score high on Reactance - they hate being told what is right and wrong, like your paper on Libertarianism showed. I guess a fair few of my friends and colleagues from this world are Libertarians. So maybe that is the new world - highly educated mildly autistic Libertarians living in high-achievement clusters in mid-sized conurbations. I also just wanted to say how great I though Comment 19 was on the difference between Left and Right policies right now: it sums it up just perfect. The geography teacher in me just had to stick this to Comment 20. The map shows principle economic centres of activity in the US and Mexico, miniaturized from a really vast map. That's where your patents come from: Denver, Bos-wash. But yes, you're quite right about clusters. The notion of clusters started from the commonplace observation that everything in retailing, from garden centres to clothing shops, tend to cluster together. You might expect that to dilute their sales. Industries such as car making do the same, which ought to push up their labour costs. That seems to happen far less than the advantages which they get from collocation: implied benchmarking, the exchange of ideas, supply economies and so forth. However, this kind of clustering is a bit different from innovation clusters. These are places from which ideas seem to propagate like seeds from a autumn tree. I do not believe that unusually-excellent or innovative economic clusters come from piling up people, even very talented people; but they certainly do not occur unless a significant number of people have come together. What does trigger them is essentially cultural. If you get a centre of excitement, people around it get excited and want to associate with it. They interact more across the network, doing so with a sense of optimism and achievement. There is an audience for new ideas. Barriers to new things are lowered, and the usual middle management defensiveness against the new is replaced by something different: a sense that good things are in the air, ahead of us, that we need to open ourselves up to these possibilities. Cities tend to generate clusters of both kinds. We know that innovation has a very short physical reach, and that technology diffusion falls to undetectable levels in a few kilometres. This is down to the networks that support the knowledge base, to the physical location of customers from high-end products and this social, intangible fact of being involved in "building the future". If clusters settle in middle sized cities, they are the more conspicuous for it, the cultural forces are that much less diluted and the frenzy that much stronger. 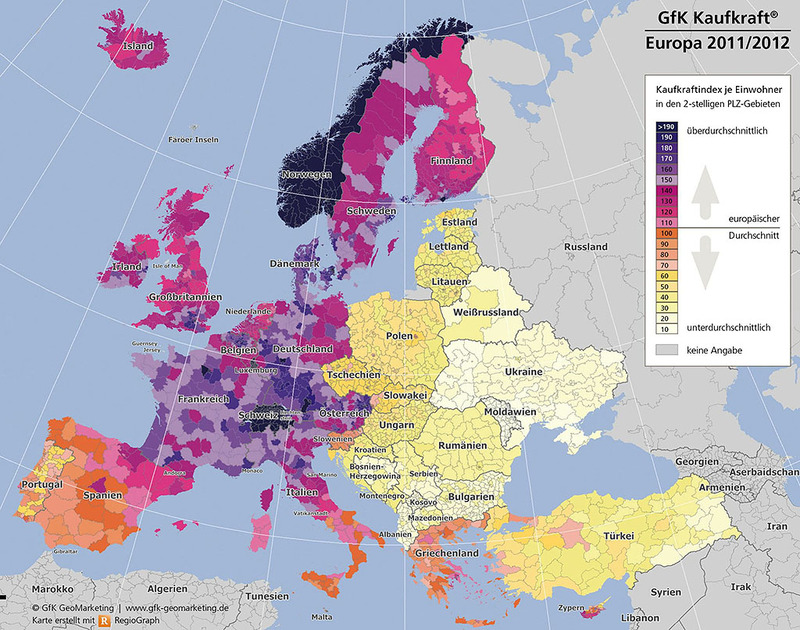 Here is a map created by GfK Kraufkraft, who have plotted the purchasing power of Europe by sub-national region. There are some oddities - Norway is not treated as sub-national regions, so its huge wealth appears to apply to areas populated only by a few seals and the bears that eat them. The main point to take from this is that everyone, everywhere, has patches of wealth generation and hinterlands in which agriculture absorbs subsidy and the elderly live on pensions. Those patches of wealth generation create most of the new ideas and, by definition, almost all of the wealth. When none of those patches matches your neighbours, you probably shouldn't enter into a currency union with them: look at the harsh line where the yellow former communist countries hit old Europe. So, in a country the dark coloured bits subsidise the lighter colours, And a map of New York or London looks just like the map of Europe, with its own rich areas and poor ones, and its own cross subsidies. Europe has locked itself into a tacit agreement whereby the purple bits will look after the orange, pink and yellow. A relatively new feature is that internationally, centres of specialisation and excellence tend to deal with each other, and not with the supporting nation state. Middle rank centres can be abandoned easily and frequently they are, with firms moving to more favourable locations. Top rank centres experience soaring rents as firms fight to win a place at the top table. Nations that penalise minor centres will lose them, but major centres are much less mobile. So you have three questions, really. First before all things, how do the purple bits stay purple, grow and maybe consolidate? There are generic features that contribute, like good management of the economy, good management in commerce, well-trained and realistic workers. Also, there are non-generic things, like whatever makes innovation occur of the kind that that goes beyond simple managerial improvement. This is where the innovation clusters have a major role. Second, should cross subsidies focus on making everywhere more "purple", or try to make the quality of life better for people through more consumption? That is, should the principle be that German capital (people, enterprise) flows to good projects in Croatia - say - with Europe doing what it can to keep Croatia a good place to invest? They can do this by political influence, by bringing down barriers to investment and by helping with some infrastructure and governance issues. Or should the principle be that German tax payers set out to make Croatians happier, by giving them a higher income, just like tax redistribution does inside Germany? Of course, if you go down the first route, you get German companies owning a lot of Croatia. If you go down the second one, you get recent history: at best, some new roads, at worst, stupid short-term state support of farmers and low skill workers, civil servants and so on. Third, How large should cross-subsidy be? The accommodation that the Left made with the state in the 1950-60 period ran something like this: commerce can get on with wealth generation, but the state must manage its methods in doing this - safety, minimum wage, labour laws - and the state must take away enough of the wealth of commerce to underwrite the ambitions of the rest of society. That used to mean: looking after a few sick and old people - both of them groups with modest expectations - and helping poor people to get an education, feel safe on their streets and stay healthy as they grew up. Times have changed, and now around 70% of the population are net beneficiaries of the state. The remaining 30%, plus commerce, support the 70%. Welfare in its broadest sense - free health, schooling and more direct social support - is by far the greatest item in the state budget. The consensus model is in difficulties. The consensus applied only within nations until World War II - Britain looks after only Britain's school children, and so on. Then it began to apply in some logarithmic way to our sense of relatedness with some disadvantaged community: Britain or Germany should give aid to the very poor Africa or India, say; and then later, and on a vastly larger scale, Germans should give aid to Greece, Italy Spain... As there is no limit to how much net transfer the world can absorb, there has to be a sensible limit to this mission creep. Yet, we have no idea what that limit is because we have no clear idea of why we do it: to give people presents - and maybe get some growth from their consumption - or to build up the world economy in a focused way. There much political rhetoric and nonsense that comes from both the Left and Right about the financial crisis. It is truly important to note that there are a large number of separate policy goals in play, often mutually contradictory. We need to ask: what problem is a government trying to solve? And note, of course, that different states will make different choices, and have different problems. Manage and reduce state debt. Cut overall state activity, subsidies, at the cost of slowing the economy. Increase operational efficiency, often leading to fewer low-skill jobs in the economy. Increase tax revenue, either through economic growth or at the cost of slowing the economy. Create low skill jobs, typically through small business stimulus. Low interest rates, at risk of low saving, medium term inflation and currency devaluation. Increase bank lending to small businesses, thereby increasing bank risk exposure. Increase welfare, which drives demand on SME output, but which also increases state costs. Mercantilist policies to protect labour-intensive, uncompetitive industries, including subsidy and tariffs. Generate broad economic growth, chiefly by getting large companies to invest. Maintain interest rates low compared to risk-weighted hurdle rates, with consequences as above. Generate "confidence": a way forward that works, political and economic stability, at home and abroad. Directly subsidise strategic and large scale industry - energy, infrastructure - with long run guarantees. Low interest rates, to prevent wide scale bankruptcies but at the cost of saving. Enhanced saving - perhaps e.g. mandated health or pension contributions - but at cost to consumption. Get house price inflation going again to restore family balance sheets. The Left and Right have different priorities. The Left argue backwards, saying that the wealthy do not consume sufficiently - that is, they save - so highly progressive taxation aimed to subsidise the poor will get into consumption quickly. That will stimulate SMEs and so generate jobs, as these are markedly inefficient and unexposed to foreign outsourcing. The Left is unconcerned about yield to savers - capital is supposed to be consuming the surplus, despite most of the earnings from capital going to the retired, who do indeed spend. State debt is generally not a major concern to the Left, which regards the resulting market responses as sniping by capital rather than the sign of a fundamental problem. When issues come to the boil, it is taken as read that these have been caused by banks, Capital and predatory commerce. Entities such as other states, the World Bank and IMF are assumed to be willing to help. The Right is concerned chiefly to get the broad sweep right: that is, the third item (general growth) is central, but consequent on the state sorting out its finances. If that causes pain, the so be it. The Right is not clear about consumer debt, and as many of its members run SMEs, it is often inclined to support policies that help them. It wants good returns to capital. It is suspicious of "strategic" initiatives - renewable energy, for example - and, except in dire emergency, opposed to general stimulus programs. It believes that if there is a choice between the state taxing and spending to stimulate, and individuals themselves spending to stimulate, then the behaviour of individuals will be both more organic and lasting than anything the state can do. "If I build a new patio, that is there for whoever owns that house. If I give the same money out in food stamps, after a few months it's all gone." Grafted onto the Left-Right model are, of course, the specific problems that the country in question faces. Spain's problems are not those of the US. The US has tottering consumer debt and a problem with industrial confidence. Spain has bankrupt banks and a skewed and often unusable work force, is embedded in a currency union that is actively unhelpful and a society that is losing its national identity. Consequently, there is no "one size fits all" policy prescription that can be offered. It is, therefore, unfortunate that the debate is set in terms of Left-Right generics rather than "what is our main problem and what do we need to do to solve it?"